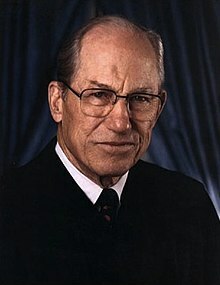 Byron Raymond "Whizzer" White (June 8, 1917 – April 15, 2002) was an American lawyer and professional American football player who served as an Associate Justice of the Supreme Court of the United States from 1962 to 1993. Born and raised in Colorado, he played college football, basketball, and baseball for the University of Colorado, finishing as the runner up for the Heisman Trophy in 1937. He was selected in the first round of the 1938 NFL Draft by the Pittsburgh Pirates and led the National Football League in rushing yards in his rookie season. Maintaining order in the classrooms has never been easy and it is evident that the school setting requires some easing of the restrictions to which searches by public authorities are ordinarily subject.